Mynard, J. (2013). Editorial: Special issue on supporting self-directed learning. Studies in Self-Access Learning Journal, 4(2), 70-72. Welcome to issue 4(2), June, 2013 which is a special issue on “supporting self-directed learning”. As professionals working in the field of self-access learning, we know that simply providing a self-access centre and expecting learners to become autonomous and engaged in self-directed study without help is unrealistic (Benson, 2011). Educators worldwide are providing support for learners in developing their self-directed learning skills in various ways: as part of a language class, as a stand-alone awareness-raising course, as self-directed learning modules outside class, through portfolio-based independent study, through online courses, through workshops offered by a self-access centre, and through face-to-face and written advising. This special issue looks at reasons why support for self-directed learning is needed, and provides examples of ways in which structured support is given. The first article by Parinaz Mohammadi (Urmia University, Iran) and Seyed Mahdi Araghi (Tabriz Payam-e-Noor University, Iran) is a good place to begin this special issue as the authors investigate the idea of “readiness for self-directed learning” through an empirical study. The authors present findings from their study that suggest that a prerequisite amount of learner training is needed before students can successfully undertake self-directed learning. In the next article, Marion Davis from Georgia State University in the USA provides an extended literature review which explores a solution of scaffolding students’ outside class learning opportunities, particularly for speaking and listening practice. The author draws on studies in language education and also other fields to investigate the benefits and challenges of self-guided learning. The next two articles look at how two institutions are supporting learners in self-directed study. Kenneth Cranker and Nicole Servais from the University of Delaware English Language Institute in the USA provide an account of how they established a system of supporting learners outside class to use self-access materials appropriately in order to focus on their language learning goals. In their article, the authors provide a guide for creating Individualized Education Plans (IEPs) for use in self-access environments along with some model forms that can be used by other educators. In the next article, Salomi Papadima-Sophocleous from Cyprus University of Technology provides results of a study that investigated the effectiveness of an optional “Catch up Study” programme of self-access learning. The intervention was successful in helping students to approach the language level required by the Common European Framework of Reference. The study also looks at students’ perceptions of the SALL programme. Finally, Katherine Thornton from Otemon Gakuin University in Japan provides the first part of a series of articles documenting one institution’s approach to evaluating and renewing its self-access curriculum, i.e. the way in which training for self-directed learning skills is offered to learners. In the first column, the author provides some background information to the project, explains the procedure for evaluation in more depth, and presents some findings from the initial environment analysis stage. 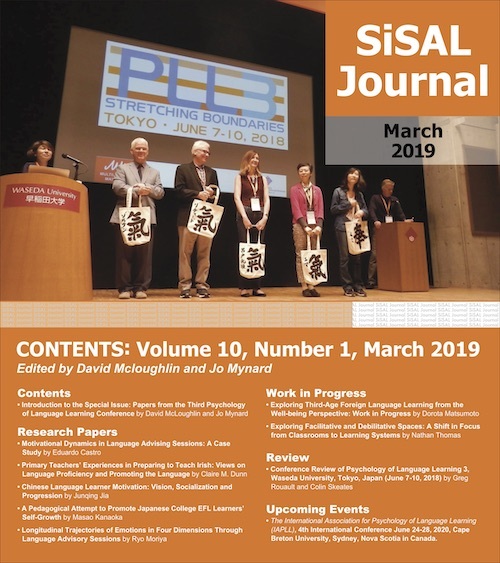 I would like to thank the authors for choosing SiSAL Journal as a venue for their work. I would also like to express my gratitude to the reviewers and the members of the editorial team for their help support with producing this issue. in Japan. She has an M.Phil. in Applied Linguistics from Trinity College, Dublin and an Ed.D. In TEFL from the University of Exeter, UK. Benson, P. (2011). Teaching and researching autonomy in language learning. Harlow, UK: Longman Pearson.